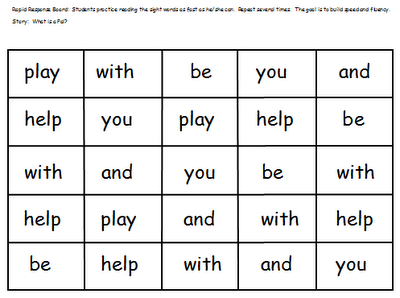 Have you ever used the rapid response boards for sight word practice? I used these last year and I must say this has been the best tool I have found to teach sight words. I send these home for homework Mon-Thurs. and then I make more copies to keep in the classroom. I use them during reading group and I also have my students get them out and partner read them with each other usually pairing a strong reader with a weaker reader. This not only helps them learn sight words but it also helps build fluency. You can also use these boards to practice letters, numbers, and shapes. To help students with b and d reversals, I made a board with only b's and d's. Instead of saying the name of the letter, I had them say their sounds. This is a wonderful tool. If you use the Journey's reading series, then click on the picture to get the set for the Unit 1. I've seen something similar to this before, but have never tried it. This past year I had about 10 kids who came to me with NO sight word knowledge. It was an uphill battle all year long trying to get them where they needed to be. These look great, but we don't use Journeys, so I will make a set for our reading series. Thanks for the idea. Thanks for the great sight word idea! Dawn, thanks for the link to this! We are currently switching over to Journeys and our heads are spinning. So all the resources are appreciated! I love the Rapid Response Boards for Journeys! Do you have Units 2-5 posted? I'd love to use them in September! Units 2 and 3 are posted now. Units 4-5 will be posted soon.